Situated in the north-eastern region of Rajasthan, Alwar offers visitors an array of sights that are both natural as well as manmade. From historical monuments and havelis, to wild life sanctuaries and reserves, Alwar has it all. Known as the Land of the Tigers or the Tiger Gate of Rajasthan, Alwar was first founded by Pratap Signh. Some of the places worthy of the visit in Alwar are the Alwar Fort, City Palace, Neemrana Fort, Vijay Mandir Palace and Government Museum. This historically significant landmark is situated 1000 feet above the Always city, hence captivating the city's skyline. The Alwar fort was built by Hasan Khan Mawati in the mid-16th century under the Mughal Rule. This fort was soon captured by the Kachhawaha Rajputs. The fort houses some of the most beautiful gates namely Chand Pol, Suraj Pol, Laksman Pol, Jai Pol, Kishan Pol, and Andheri Pol. The fort has about 10 such pols and several other temple ruins. Constructed by Raja Bakhtawar Singh in the early 18th century, the City Palace boasts a unique blend of Rajput and Mughal Architecture. Housing a total of almost 51 towers and 446 openings, the palace is quite a massive structure. But although it is known for its enormity, the palace is nothing short of breathe taking. Constructed with marble with intricate details in the interiors, the palace is definitely worth the while. One can visit the library that houses a huge collection of old books and oriental manuscripts, armoury, swords and weapons from the yester years. 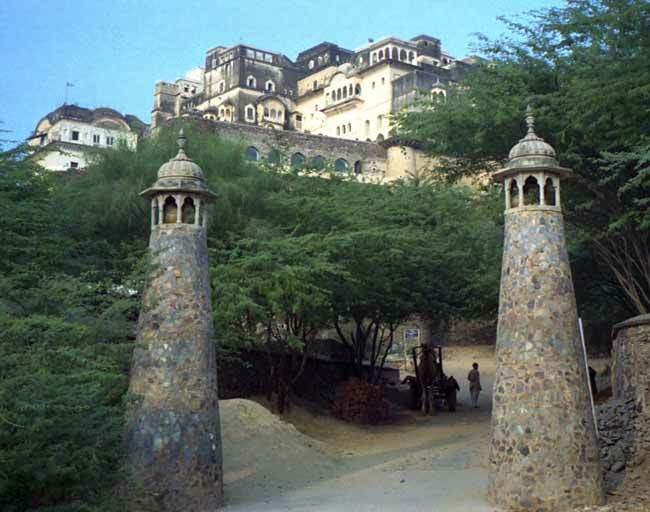 This fort is considered one of the best forts in Alwar. Constructed by the Chauhan rulers, the fort boast a robust Rajput architecture and style. Today the fort is being renovated to house a heritage hotel. Constructed in 1918, the Vijay Mandir Palace was built by Maharaja Jai Singh. The design of the palace is such that it looks like a boat sailing in the water. The reflection of this ornate palace can be seen in the adjoining lake named the Vijay Sagar Lake. With 105 rooms in total, the palace is known for its colossal size with each room regally decorated. The palace also house a temple dedicated to Lord Rama, and his wife Sita. Housing the artefacts of the kings of Alwar, the Government Museum is one place you cannot miss visiting. Preserving priceless artefacts, mementoes and testimonials from various Rajput and Mughal nobility, you can see the sword of Sultan Mohammed Ghori, Akber and Auranzeb. Along with that, the museum also houses, manuscripts, books, arms and other artefacts from yester years.